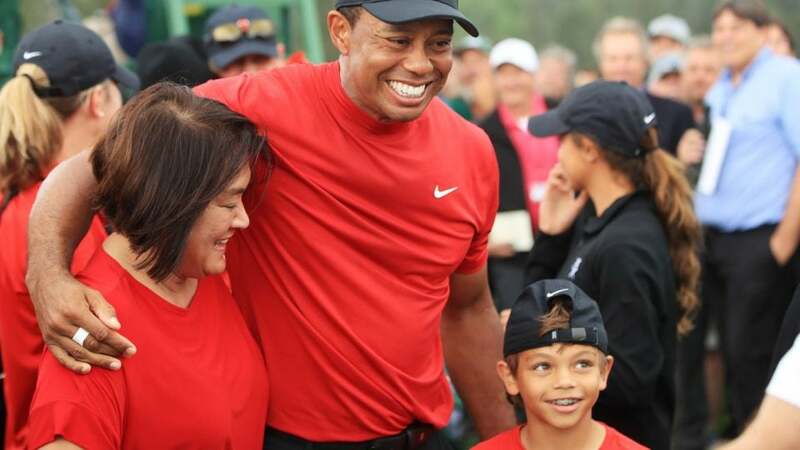 There is a whole lot to love about Tiger Woods’ triumphant victory Sunday at the 2019 Masters. But of all the great moments, it’s hard to beat his adorable celebration with his kids, mom and girlfriend off the 18th tee. Tiger finished off his bogey at the final hole to cap off his one-shot victory, and let out a bevy of fist-pumps with a smile as wide as the fairways at Augusta National. After shaking hands with his playing partners, and while being showered with “Tiger! Tiger!” chants from Masters patrons, Woods hugged caddie Joe LaCava and then made a beeline off the green to find his family. Tiger found who he was looking for just off the green behind a TV tower. He first hugged his son Charlie and lifted him into the air. Next up was his mother Kultida, who has been at Tiger’s side through thick and thin. He gave her a hug for the ages, and the moment recalled the conclusion of Tiger’s first Masters win in 1997. That Sunday, 22 years ago, Woods embraced his father Earl and broke into sobs in a memorable moment. Tiger’s daughter Sam, his eldest child, got the next hug from her beaming father. Finally, Tiger embraced his girlfriend, Erica Herman, before making his way down the line of admirers. For Tiger and his kids, it was a moment they will never forget, and one they’ve been waiting for all their lives. Sam was born a year before Tiger’s 14th major win at the 2008 U.S. Open, but she was too young to remember it herself. Charlie has not been alive for any of them. He was born in 2009. After his near-miss at last year’s British Open, Woods seemed disappointed in himself for not being able to bring home a victory for his kids, who were in attendance at Carnoustie. Now, Tiger and his young family have the moment they have been waiting for. And, who knows, maybe there are a lot more to come.